cooking, food, Homemade vegetable soup, how to use up leftover vegetables, leftovers, Recipes, stew, Whatever Happened to Dinner? I will never forget the first time I made stew for Stuart in the first year we were married. 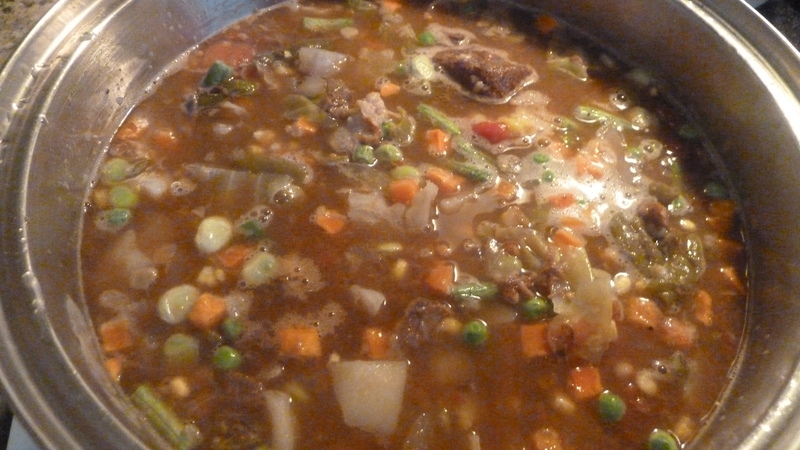 My stew had big chunks of beef, potatoes, cabbage, onion, carrots, and beef broth–and that was about it. Perfectly fine stew in my book, and in my family’s tradition. He looked at it, ate a few bites, asked “what is this?”—and you know how the newlywed conversation went downhill from there. I was dumbfounded. 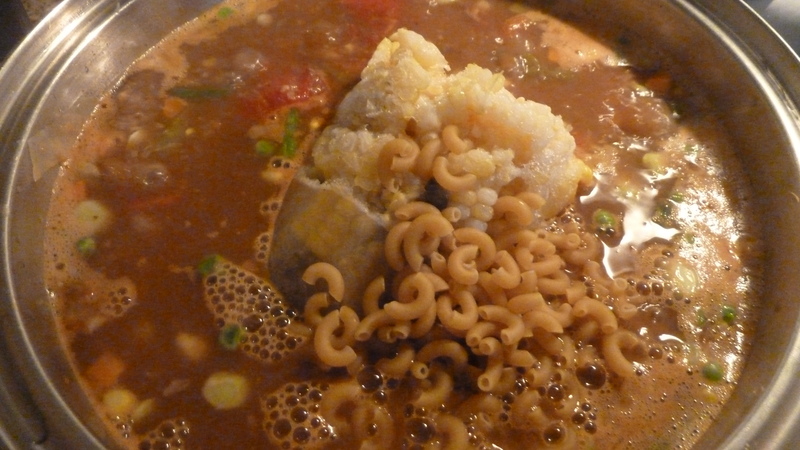 What was wrong with my soup? My stew? My delicious wonderful dish? So what kind of stew did the Davises fix? Well, turns out they call it homemade vegetable soup. Over the next weeks and months, I inquired and watched and tasted and gradually learned to make my own variation of the homemade vegetable soup that folks around here typically make and sell in quart jars at fall and Christmas bazaars and craft shows, or take to neighbors who are ill, or when a loved one passes away. Love it, and I’ll never turn back to my staid old stew. My actual recipe for this soup has evolved over the years, changes a little every time I make it, and now I throw in everything but the refrigerator. When the leaves change and the thermometer drops, it is time for this soup. My husband likes it with hot bread and peanut butter; I like it with hot bread and cheese. The best homemade bread to serve with it is More with Less Cookbook’s oatmeal bread, which I talk about here. I don’t know if this type soup is a Virginia thing, a southern thing, or a Shenandoah Valley thing. Anyone? 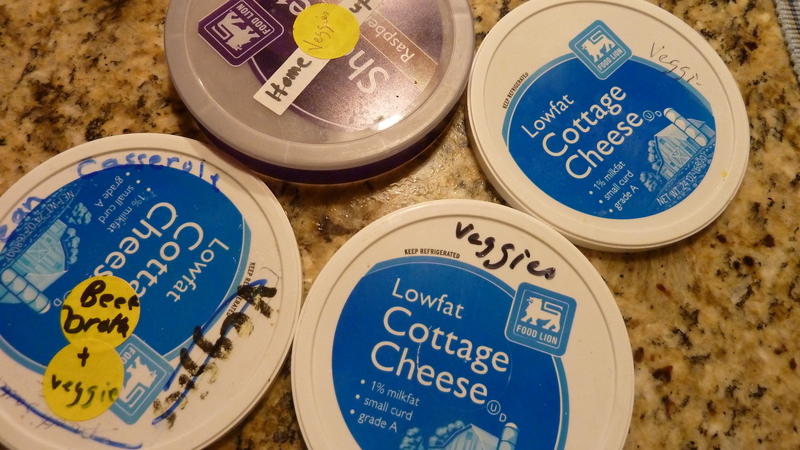 (I talked about those regional or family food traditions here.) Another family favorite, Brunswick stew, is definitely a southern and Virginia thing, and I’ll talk about that (and give recipe for) sometime too. What do you think? Do ya’ll make this kind of everything-but-the-refrigerator soup up north? 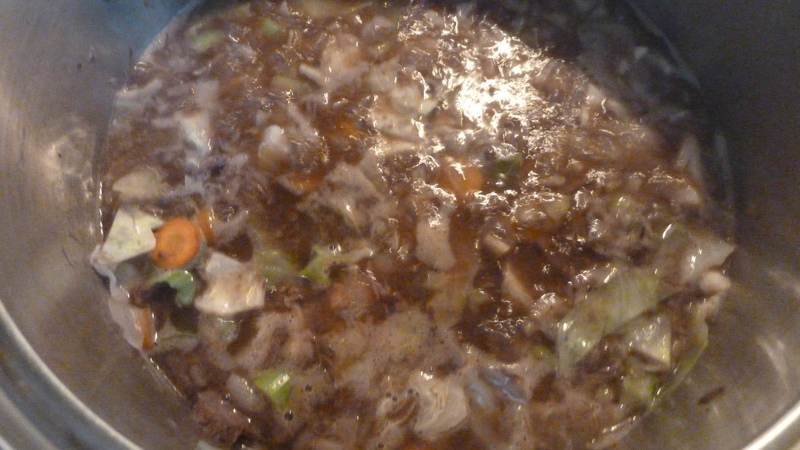 In 5 quart Dutch oven or other large kettle, brown diced stew meat in oil 5-10 minutes. While that’s browning, chop potatoes in small cubes, slice carrots, celery, chop cabbage. Set aside. Add tomatoes and then all raw vegetables to the meat. Add water, beef or ham bone if you have any (for flavoring, optional), salt and pepper. Bring to boil and simmer to cook vegetables for 30 minutes. 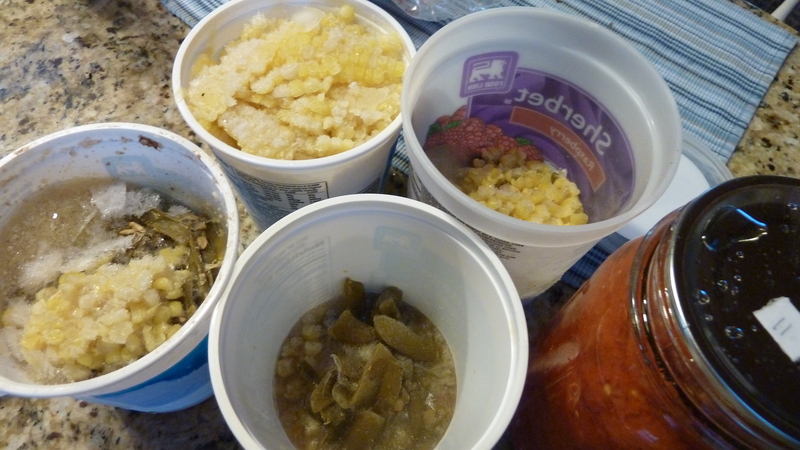 Add leftover vegetables (as listed) or any quick cooking frozen vegetables you have. Add macaroni. Stir frequently to keep macaroni from sticking. Cook 30 minutes more. Remove bone, celery leaves. Serve. Makes a large pot of soup, probably enough to serve at least 8. P.S. The best part about this kettle of soup is you likely have enough for 2 or three meals, depending on the size of your family. P.P. S. S. This soup didn’t make the cut for inclusion in my Whatever Happened to Dinner: Recipes and Reflections for Mealtime book but almost 100 delicious recipes from (mostly) Shenandoah Valley of Virginia families did. It does include Brunswick Stew. Check it out. Book sold here. Another P.S. Notice I added a search tool and one of those nifty cloud things for frequent topics. Your vegetable soup is not just a Virginia or southern thing. I live in northern Michigan and make mine much like yours, including saving leftover vegetables in the freezer. I do use more dried beans (a variety of what ever kinds I have) and lentals. I don’t usually add cabbage unless I am short on vegetables. I also add barley rather than pasta. A hand full of split peas makes a richer broth Oh, and I don’t like corn in mine.. Mine is never quite the same, but always seems to ‘hit the spot’. Your additions sound interesting … I would love the lentils or barley in it, my husband … not so much. I do like the “never quite the same” but children are less inclined that way, right? I do remember once they started chopping up veggies for it, they loved it even more. Thanks for commenting!